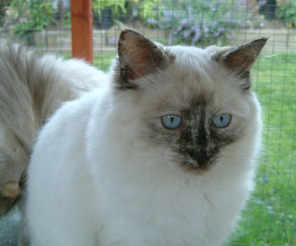 Peggy is a blue tortie colourpoint girl and my first breeding girl. I fell head over heals in love with her when she was about six weeks of age and kept a close eye on her progress. I have always had a soft spot for tortie or calico cats no matter what breed. They have the most charming temperament all of their own. Peggy joined my in October 2004 and had her first litter in October 2005. She had three kittens, one Jimjams I have kept and the other two, Tilly and Timmy are with colleagues that I work with so I am constantly in touch with their progress. She is also the mother of Roxy, my seal tortie colourpoint girl that I have kept. She can be a very loving girl with people but can be quite a bossy lady when it comes to the other cats and is not adverse to giving her son a clip around the ear no matter how big he is. That's what mum's are for, I guess. She has good type for a Ragdoll, good firm chin, good profile and boning. Her fine silky coat that she does pass on to her babies takes very little maintenance. Peggy has now been neutered but her line carries on with Magisragis Busbys Babe. In July 2011 Peggy started a new career on the show bench. She took to it like a duck to water thoroughly enjoying her days out and gained her premier title in three consecutive shows and has also been placed in nearly all her side classes. Thank you to her judges Mrs Gillson, Mrs Culf and Mrs Butters. A big thank you to my good friend, Sue Allen, on letting me have this special lady as my first breeding girl. Roxy is the seal tortie girl I have always wanted. She was born a singleton on 6th February 2006 hence the name Busbys Babe in honour of the people who died in the Munich air disaster on that day in 1958. She is a red and proud. A pretty little girl who lives in a tortie world of her own most of the time. Very playfull and lively with a very loud purr. Loves nothing better than to sit on a high perch and watch life go by whilst daydreaming. Also has the nickname of Rocket as she can rush around at top speed, she always seems to have a lot to do. Roxy has now been neutered. She has an extreme retrousse profile and what I consider to be very good Ragdoll type. I would like to introduce you to my new potential future breeding queen, Jemima. 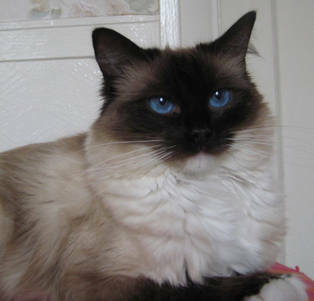 Jemima is a perfectly marked seal mitted girl and the girl I always hoped I would breed one day. She is as bright as a button, never has time to settle down, always got better 'things' to do and I can see her ruling the roost as she gets older. She is just a little bit 'different' to her siblings and developing a cheeky character very quickly. 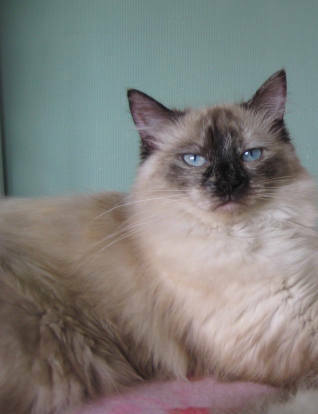 She has that beautiful seal mitted 'look' that I adore and that drew me to the Ragdoll breed in the first place. 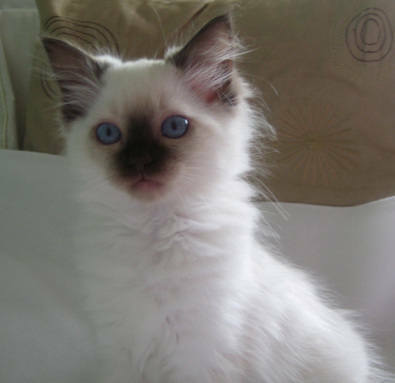 'Mim' has attended some cat shows with her brother 'Ernie' and has thoroughly enjoyed her days out. Jemima had her first litter of kittens in May 2012 and she has proved to be a fabulous mother. Merry was born in May 2011 and is Roxy's daughter. 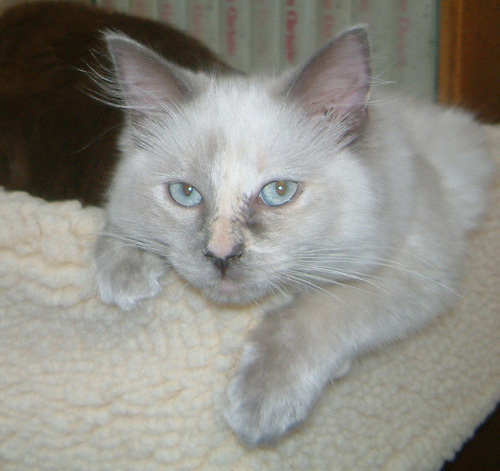 Merry is a very gentle and playful girl with a very soft and silky coat that requires no maintenance. A friend to all the cats in my household and always spares time to play with little kittens. She spends each night sleeping at the foot of my bed and has a loud purr for honoured humans! Merry became a mother in May 2012 and has been a fantastic mother, very attentive and loving. Coco was born in April 2012 and is Florence's daughter. Coco is a very pretty little girl who certainly knows it and has an air of superiority about her. A little diva in the making. She is the first chocolate female I have bred. In July 2013 Coco had her first litter of kittens and has proved to be a fabulous mother. Very caring and attentive. Gloria is another very pretty lady who can be very bossy! Never one to keep quiet and always one to tell you a story. She is a bonny girl who loves her food. She has the most amazing, soft, silky coat that is very low maintenance. She had her first litter of kittens on 4th July and has proved to be a fabulous mother. Very protective and caring.